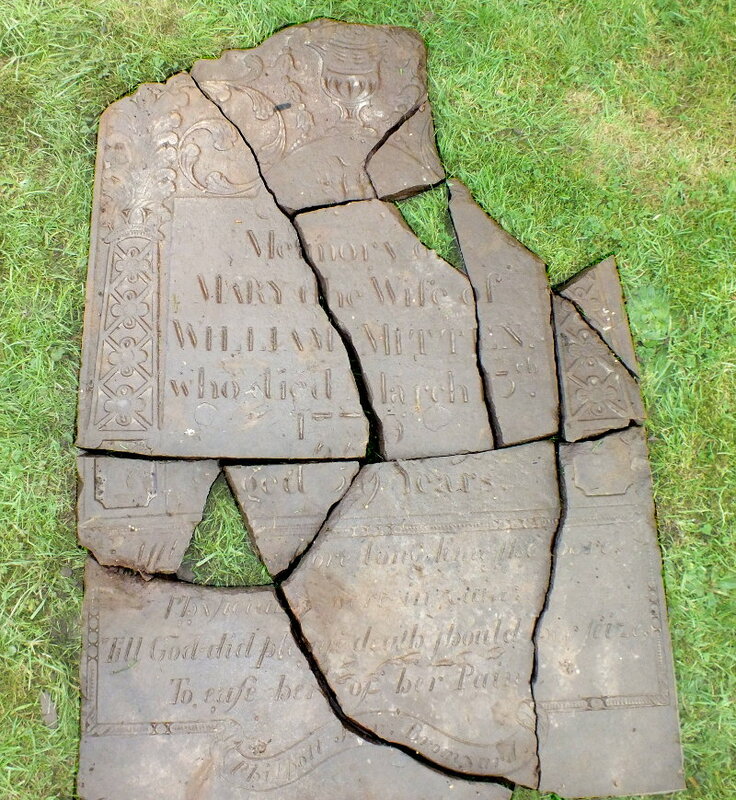 This gravestone was discovered during construction work in the churchyard in late 2016. It was buried between graves 228 and 235 and appears to have been deliberately broken. Although the gravestone carving is crisp amd clear, the grave is not recorded by Rev. Samuel Bentley in his 1891 history so presumably was buried and lost before that date. There is a query on the surname. On the stone, Mary’s surname is ‘MITTEN’ but it is recorded in the parish burials register spelled ‘MITTON’. William and Mary’s two sons, William and John, are recorded in the parish baptisms register but again with the surname ‘MITTON’. Both spellings occur in census records but ‘MITTON’ is by far the commonest. The name is said to come from a place name in Old English ‘mydd-tun’ meaning ‘settlement in the middle’. The family came to Bosbury and then left with no clue as to where they went. To ease her of her Pain.